Miller Hardware was one of the historic businesses of Ray City, GA. The Ray City store was managed by Arthur Harvel Miller, brother of Lint Miller. Leon Clyde Miller clerked in the store. Charlie Parham and M. C. Lee were among the investors. According to the Annual Report of the Secretary of State, the Miller Hardware & Furniture store located at Milltown, GA was incorporated in 1913 with a capital of $25,000. The trade journal Southern Hardware, Volumes 79-80, June 1918, W.R.C. Smith Pub. Co., 1918 pg 66 announced the incorporation of a Miller Hardware & Furniture Company store at Ray City. Image Right: W. L. Miller and Lena Lee circa 1908. 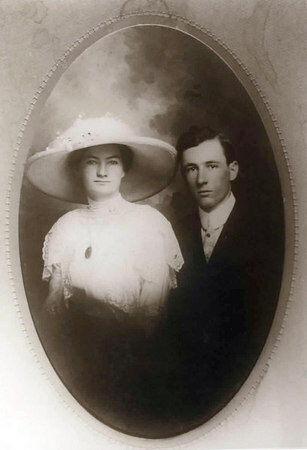 The couple were married in 1913 (see larger images at Berrien County Historical Foundation). Willis Linton “Lint” Miller was the President and General Manager of the company. Later he served as Chairman of the State Highway Department. James Thomas Phillips was a salesman for the company. Leon Earl Thigpen was a clerk at the Milltown location. By 1923, the company letterhead boasted the capital stock had grown to $35,000. The letter head pictured below was from a document included in the death papers of Francis Marion Shaw. From A.J. Johnson’s 1863 Map of Georgia and Alabama, it is plain to see that the renown of General Levi J. Knight first put the location of Ray City, GA on the map – indicated simply as “Knight” (See Knight Community) . The family of Levi J. Knight had a long tradition of civil and military service. On his mother’s side, his grandfather, William Cone, was a Baptist pastor and Revolutionary soldier who served as a captain in McLean’s Regiment of Georgia Troops, under General Francis Marion. William Cone served as a major in the 1st Battalion of the Richmond County Militia. 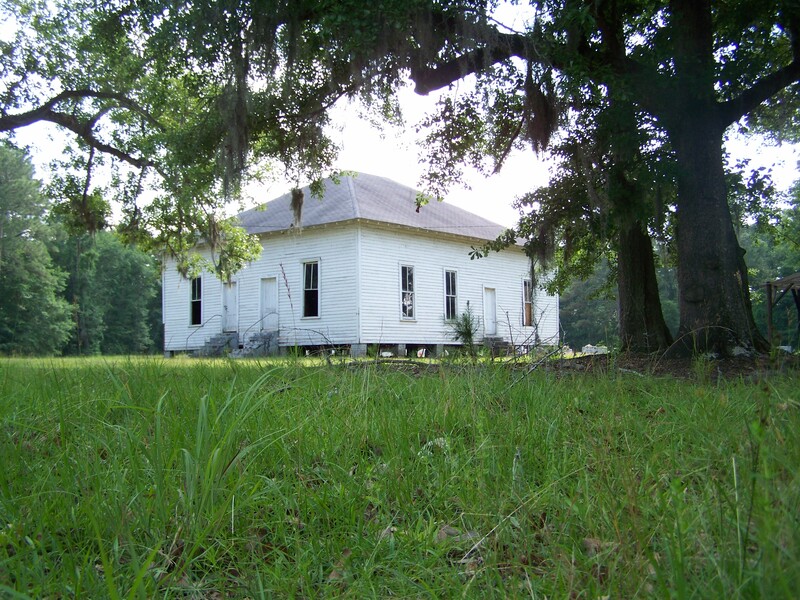 “When the notorious Tory, McGirth, and his followers were terrorizing that region of the state now known as Bulloch county, it was learned that one Cargill harbored Tories and gave them information about Whigs. Cargill was advised that it meant death if he was again found in company with McGirth. Not long after, when William Cone was hunting deer on the Ogeechee, he saw them together in the woods. He shot Cargill, but McGirth escaped and the next day when they went to bury the dead man it was found that the wolves had almost devoured his body. Daniel McGirth made more than one narrow escape. 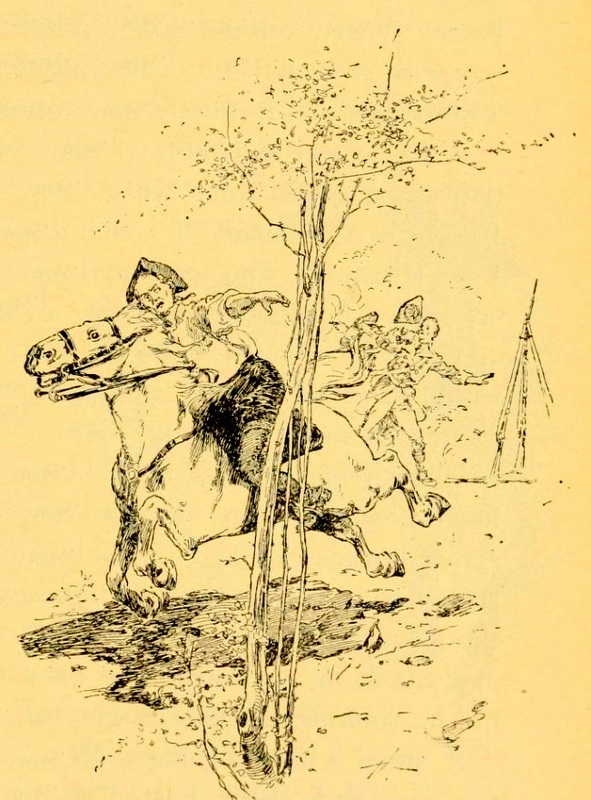 Illustration from Stories of Georgia, by Joel Chandler Harris. A brief but interesting sidebar in the Dec 6, 1921 edition of the Atlanta Journal Constitution contains a now obscure reference to the ‘yeggmen’ that beset the Ray City Post Office. Fortunately for our understanding, the intellectuals of that time were there to document such obscurities. A detail of the U.S. Coast Survey Map of Southern Georgia and Part of South Carolina, 1865 depicts the locations of Douglas, Bird’s Mill, Guest, and Nashville, where Nathan W. Byrd resided from 1854 to 1881. 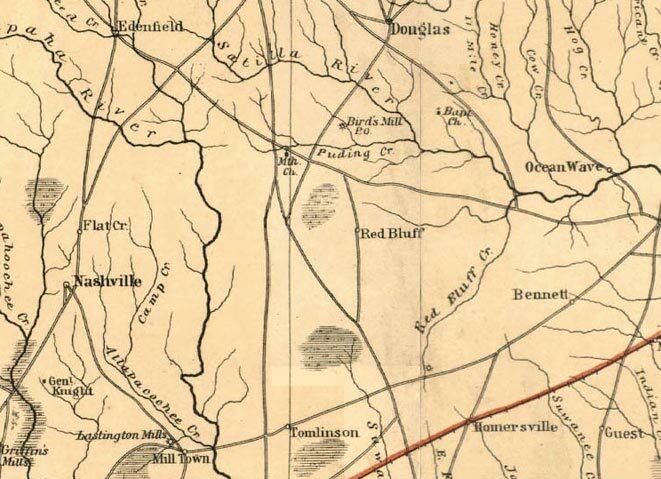 Milltown, GA and General Levi J. Knight’s residence (site of Ray’s Mill) are also depicted, as well as early roads in the area, although some locations are distorted by the cartographer. Folks Huxford compiled a sketch of Nathan W. Byrd in the first volume of Pioneers of Wiregrass Georgia. Much of the information in his sketch can be cited to the enumeration of Nathan W. Byrd in the census data of 1840, 1850, 1860, 1870, and 1880. Nathan Byrd also appears in the Slave Schedules of the 1850 and 1860 census and in the 1864 Census for Re-organizing the Georgia Militia in Clinch County. 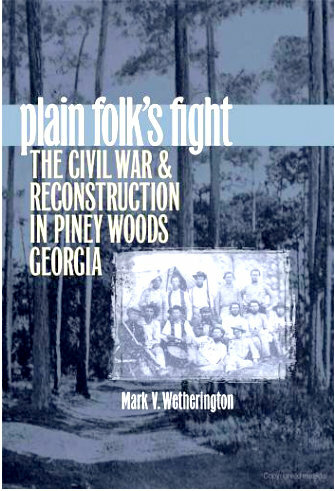 According to the histories of Folks Huxford, Nathan W. Byrd was a mail carrier on the postal route serving Ray’s Mill, GA in the peoriod after the civil war. The 1876 records of the U.S. Congress show that Nathan W. Byrd put in a bid to carry the mail on the route from Nashville, GA to Allapaha, GA that year. The route was awarded to William J. Nelson of Allapaha, who was contracted to provide the mail service for $190 per year. That sum would equate to about $49,300 in 2009 dollars.